Reading and share top 1 Colonel Robert Ingersoll famous quotes and sayings. 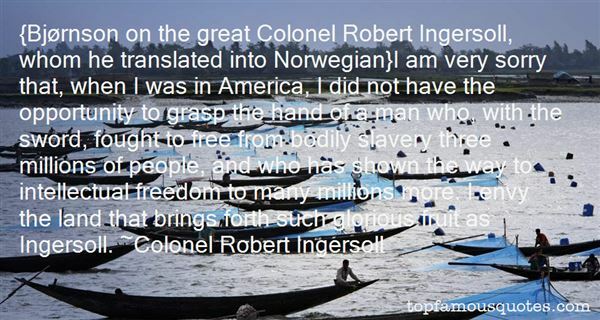 Browse top 1 most favorite famous quotes and sayings by Colonel Robert Ingersoll. To feel anything deranges you. To be seenfeeling anything strips younaked. In the grip of itpleasure or pain doesn'tmatter. You think whatwill they do what newpower will they acquire ifthey see me naked likethis. If they see youfeeling. You have no ideawhat. It's not about them.To be seen is the penalty."